Though Liane Moriarty has been popular for much longer in her native Australia, it wasn’t until her fifth book that she made a huge splash here in America. I read that fifth book, The Husband’s Secret, and really enjoyed it. But while it was sharp and witty and addicting (seriously, couldn’t put it down), there was still an element of sadness to it that made me not really fall in love with the story. After all, the husband has a dark secret, and you can’t get around how bad that secret feels, even when everything is resolved in the best way that it could be. Still, the writing was top-notch and the story was rich. I liked it enough to buy her next release, Big Little Lies, the day it came out, and it was worth every penny of the cover price. I was instantly hooked and read until the very end with a giant smile on my face because I knew I was reading something exceptionally good. Big Little Lies takes place in a seaside Australian town, and the central story has a great hook: a parent-teacher fundraising party for a kindergarten class gets so out of control that someone is murdered, and other than the fact that the victim is a major character, the reader has no idea who, how, or why. Interspersed throughout the novel are snippets of news reports and interviews with people at the party, so you get bits and pieces but no actual information until later in the story. It’s a brilliant, well-paced reveal that keeps you up reading way past your bedtime (or in my case, way past state lines: I read this on a road-trip home from Florida, and my poor car-mates didn’t hear a peep out of me for about twelve hours). The story features three main protagonists/POVs: Madeline, a whirlwind of a character who can be a major gossip but also always has your back; Celeste, a beautiful, kind soul with a deep dark secret of her own; and Jane, a 22-year-old mother who comes to town for a fresh start after a traumatic event in her past. Madeline and Celeste take Jane under their wing, and suddenly their lives are interconnected in really imaginative, ingenious ways. All of this culminates the night of the murder/kindergarten-parent party, and the story is told in segments leading up to that night. The entire time I was reading, I was admiring the writing and the twists and turns – I loved every minute and every plot reveal. BLL has every single element that I loved about The Husband’s Secret (scandal, intrigue, rich characters, sharp dialogue, a hilariously sarcastic sense of humor) but it also addressed the problems I found in the first one: there’s a central mystery here, and a death that needs to be explained, but it’s handled in a much lighter (more fun!) manner, and the secret isn’t so dark that you can’t root for all the main characters. 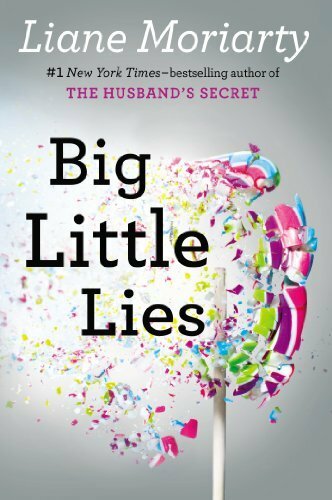 If you want something completely addicting (I wish I had this book for every road-trip), light-hearted but still substantial, and really well-written and layered, then I highly recommend Big Little Lies. And you know I’ll be buying the author’s next novel the day it comes out, too. I felt the same way about The Husband’s Secret! I loved this one, but I loved What Alice Forgot even more. Have you read that one? Ooh now I will have to read What Alice Forgot! I was planning on reading another one of hers soon but hadn’t decided which yet. Thanks for the comment and recommendation!